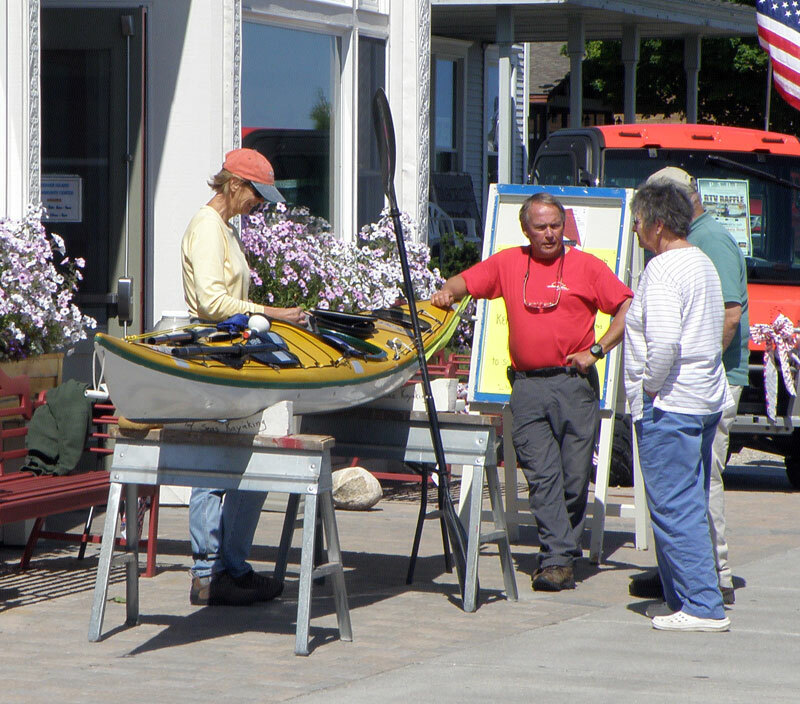 Sunday, August 30, 2009: Set up kayak at the Beaver Island Community Center and provide information to anyone who wants questions answered. Plans this evening to include making a few repairs to the kayak, pack up all supplies, and prepare for the trip. September 1, 2009: Ken is having some issue with back pain. He is working to get that resolved at East Wind Spa. Departure was delayed due to this issue. The information will be update as soon as information is available. 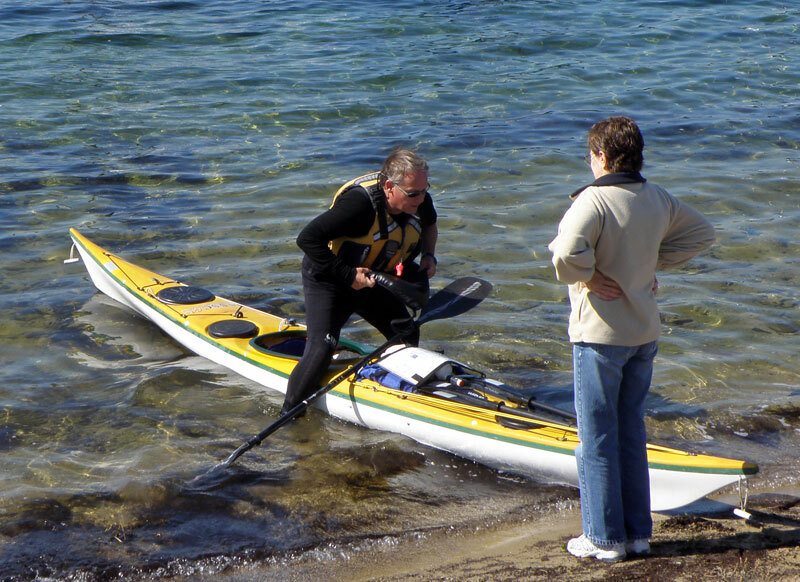 Wednesday, September 2, 2009: Ken Bruland began his 85 mile Paddle for Food this morning at 11:30 a.m. His first leg will be from Paradise Bay to the southeast end of Hog Island where he plans to spend the night. Quick adjustment at the point.....out the mouth of the harbor......open water...Hog Island Here We Come! September 2, 2009, evening camp on Hog Island: Ken got to Hog Island and set up camp for the night. September 3, 2009: Ken reported that he left Hog Island between 8:15 and 8:30 a.m. 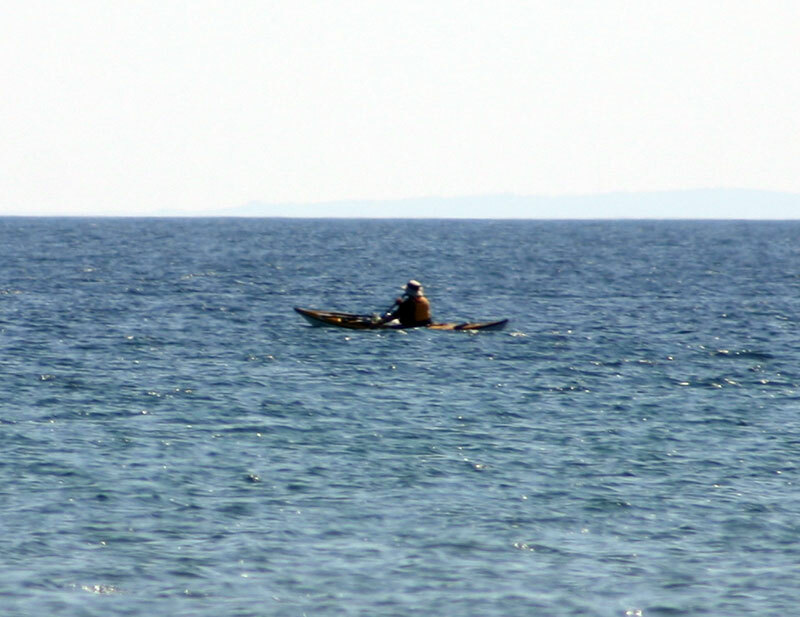 He is paddling east toward Gray's Reef Lighthouse, which is the very small light-colored object in the last picture above on the horizon. This may take him five hours or more depending upon the wind and other boat traffic. 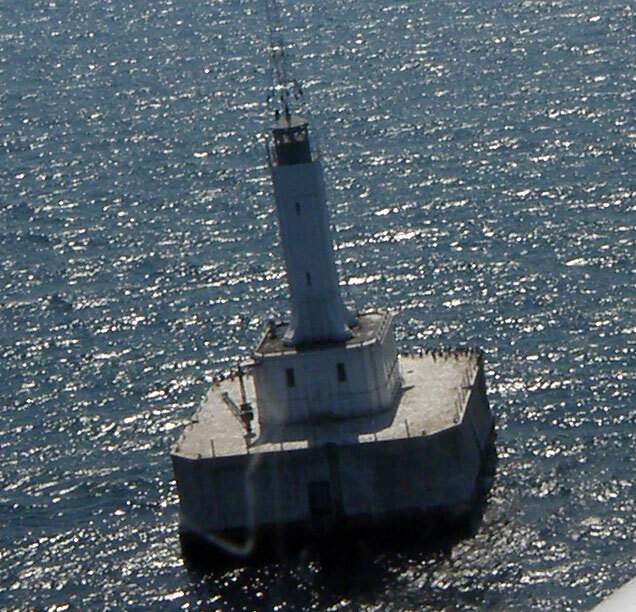 September 3, 2009: Ken reported in and planned to leave Gray's Reef Light at 12:40 p.m. today enroute to Waugoshanse Light and Point. Island Airways provided a flight to check on Ken's progress, and Ken was halfway across the shipping lane at 1:40 p.m. The video clip shows the Southeast shore of Hog Island, Ken paddling, and Waugoshanse Point Light. 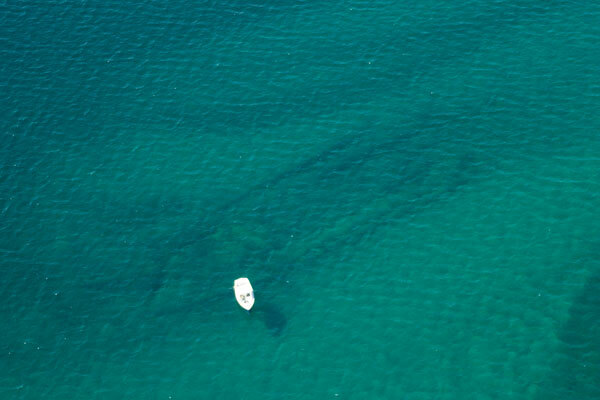 Frank Solle took these photos on the Island Airways Flyover as well. Thank you, Frank! On the way back to Beaver Island, Frank took these photos. Thank you, Paul Welke for the opportunity to get these pictures! Thank you, again, Frank Solle for the wonderful photographs! September 4, 2009, 10:30 a.m.: No communication has been received from Ken Bruland last evening or this morning, but this is not an unusal situation nor an alarming situation since cellphone coverage and radio coverage from this area of the mainland is know to be very spotty to almost non-existent. As soon as any communication is received, this site will be updated with that information. September 4, 2009, 1:00p.m. : Ken check in, but the cellphone signal was still iffy. Ken rested up a little about three miles north of Waugoshance Point where he camped for the night. Ken made his own camp there. He rested up until noon because he was a little tired and sore from yesterday's paddle. His plan is to continue north and camp around Cecil, between Cecil and Mackinac City, tonight. He will plan to go under the bridge about 1 or 2 p.m. tomorrow. September 5, 2009: 7 a.m.: Ken checked in by cellphone, leaving a message last night. He arrived near Cecil about 3:30 p.m. 9/4/09 and decided to continue after a short rest. 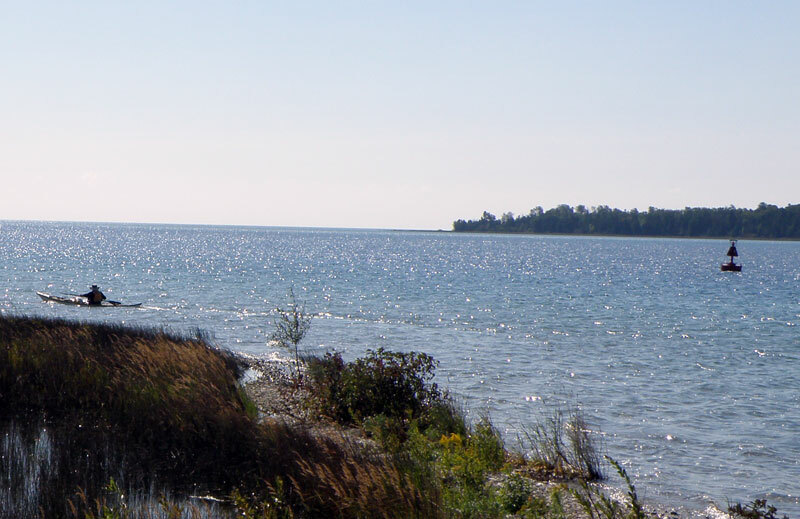 Ken camped at McGulpin Point, about one mile from Mackinac City. 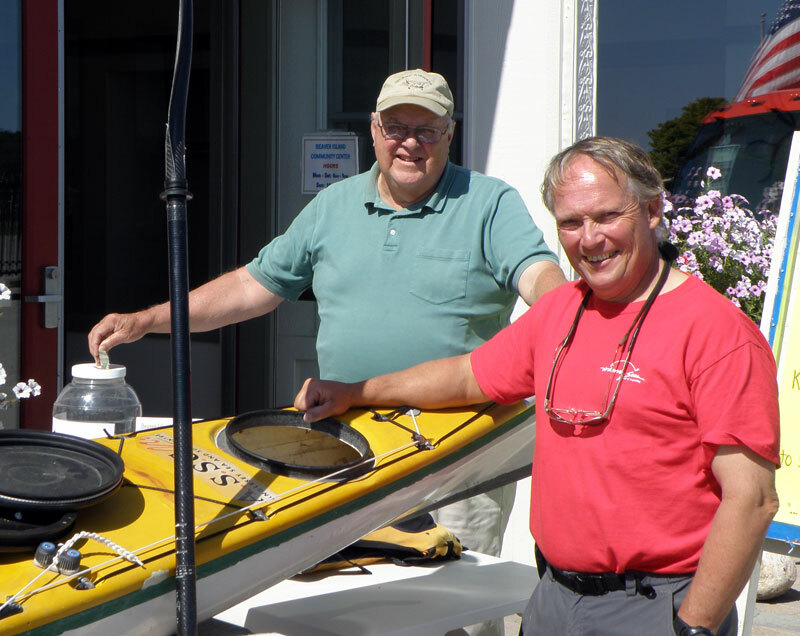 His revised plans include some rest and relaxation, then a trip into Mackinac City as well as some shopping for a camera battery or camera before paddling the Straits of Mackinac. His estimation of crossing time is revised to between 3 and 4 p.m.
September 5, 2009: 5:20 p.m. Ken checked in by cellphone. 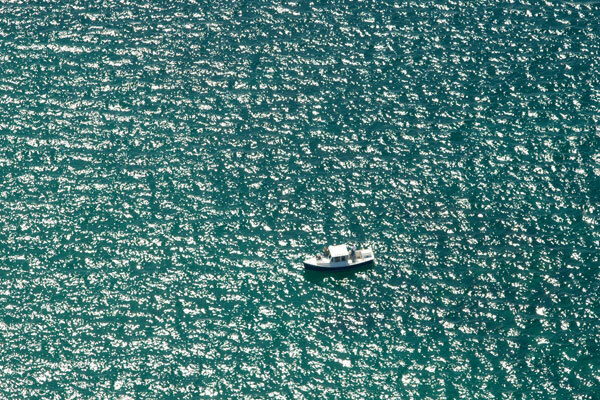 He has crossed the Straits of Mackinac and is looking for a place to camp. 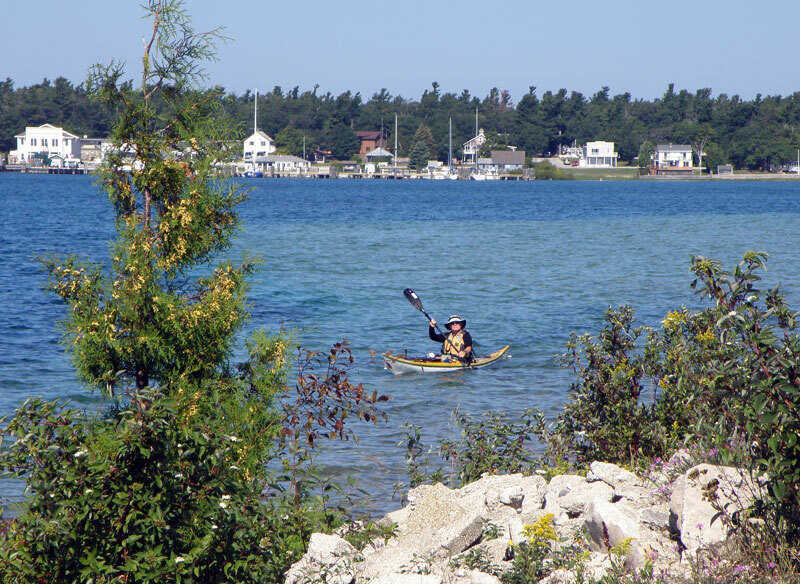 He hopes to camp in the Straits State Park at St. Ignace. "No room at the inn" caused Ken to walk into St. Ignace and get a motel room. He plans to rest up a little for at least one day, maybe two before continuing his journey. 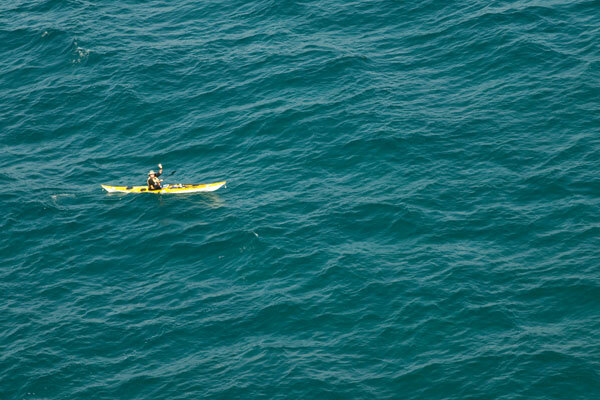 September 6, 2009: approximately 2 p.m. Ken left Straits State Park and paddled around the point there. 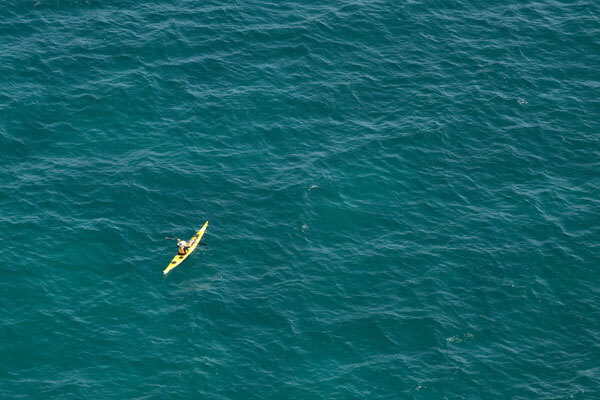 At 4:10 p.m., Ken was about one mile out from the Castle Rock with plans to continue paddling north from there. He will search for a place to camp tonight after the expensive $152 motel room last night. 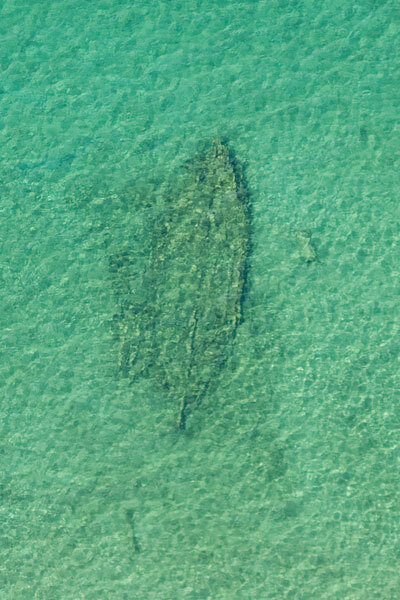 September 6, 2009: 7:50 p.m. Ken reported he was on the southern tip of Big St. Martin's Island. He had stopped at Rabbit Back Point for a late lunch and then continued on. 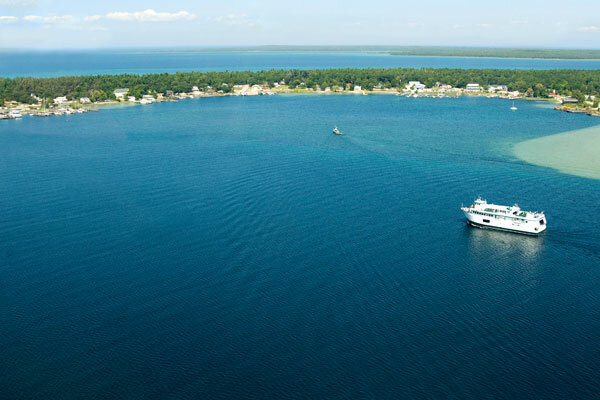 He stated he could see the northern most tip of Mackinac Island, which was approximately 8-10 miles south of his location. Ken also stated that he is quite a bit ahead of schedule. He could possibly be in Hessel tomorrow, which is about 12-13 miles away. His final destination is only 15-18 miles from Hessel. Ken had not made up his mind when he would continue the journey at this time. He needed to find a good camping spot and set up camp before dark. 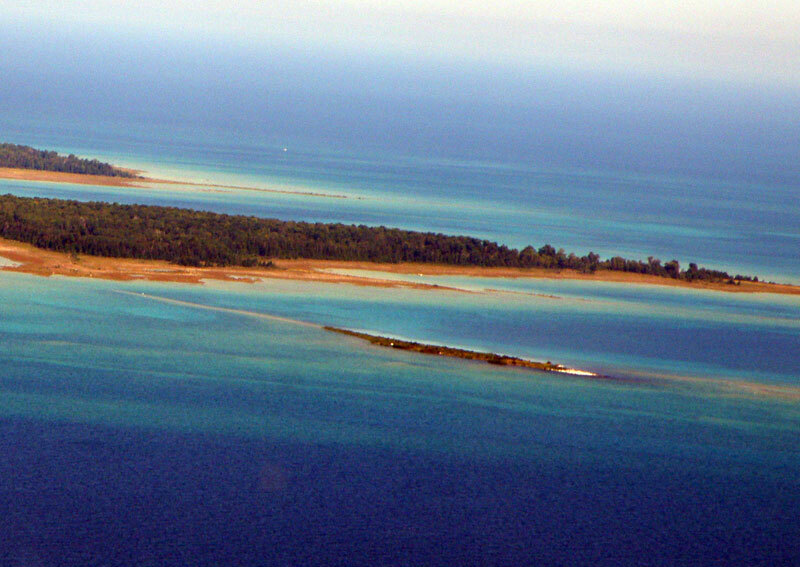 September 7, 2009: 11:45 a.m. Ken reported that he was leaving Big St. Martin's Island enroute to Hessel. "The next island over is 3 miles away," Ken said, "but I can't see it. There's only about 100 yards of visibility due to the fog." Ken was leaving in the fog direct toward Hessel just to make a bit more of an adventure of this trip. September 7, 2009, 5:20 p.m. Ken reported in that he was at Hessel and planned to spend the night in a motel before heading on. 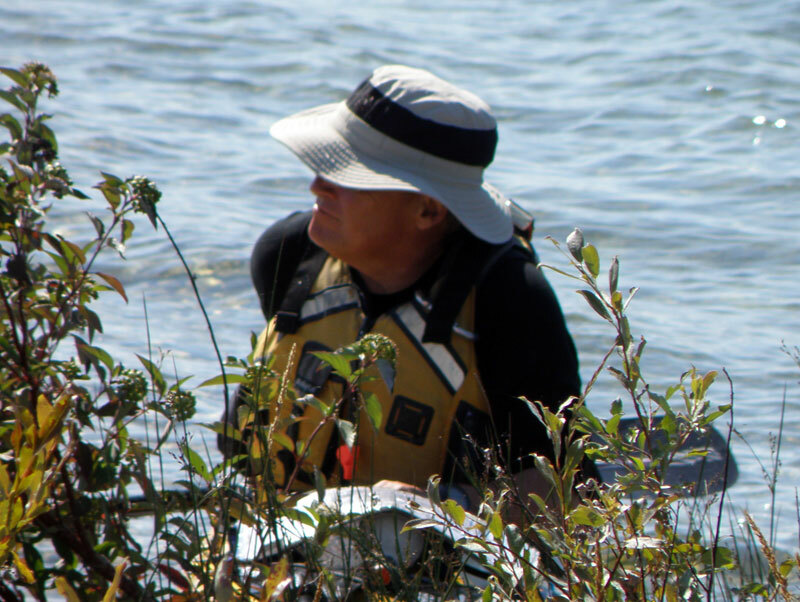 September 8, 2009, 1:10 p.m. Ken reported that he was enroute to Government Island, the only Les Cheneaux Island in the chain that is not privately owned, to camp for the night. He had hoped to camp just off the southern tip of that Island on a much smaller island called Penny Island. September 8, 2009, 5:45 p.m. Ken reported that he has arrived at Penny Island just off the southern tip of Government Island. He stated he could walk to Government Island, but he'd get wet. Ken is only six miles away from his final destination of Prentiss Bay. 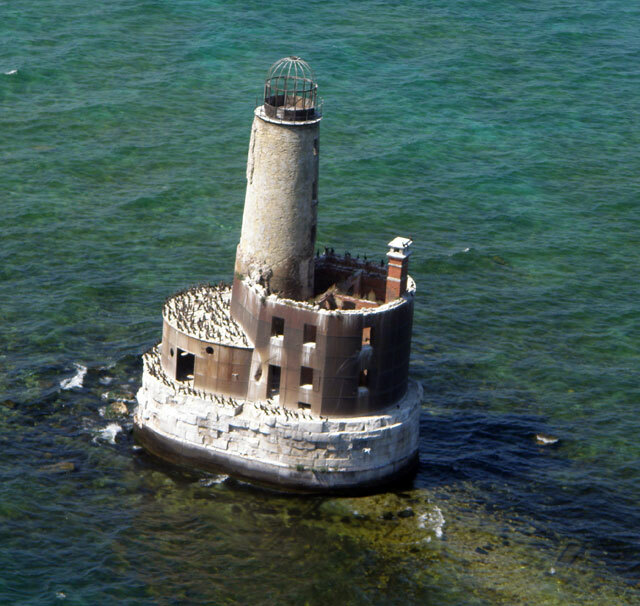 September 9, 2009: 12:05 p.m. Ken left Government Island enroute to Prentiss Bay, his final destination. 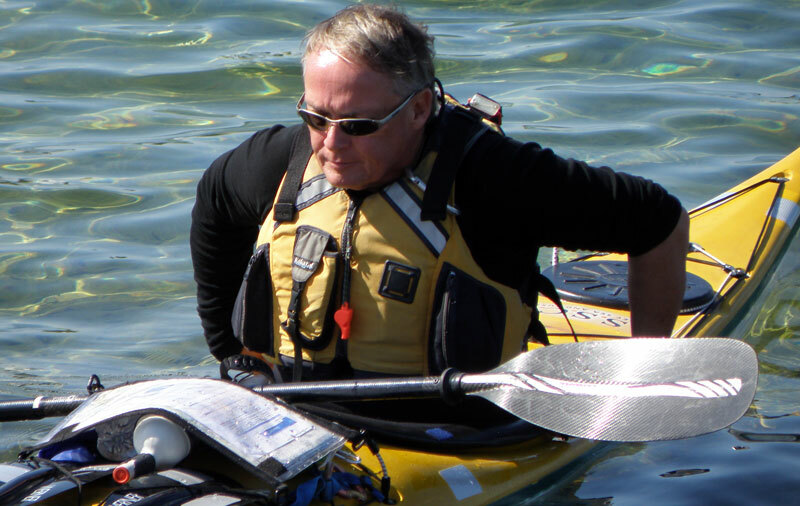 He is two days ahead of schedule for the kayaking symposium that will be held at Cedar Campus. It is dead calm, no wind, and no fog. Ken is leaving all his gear on Penny Island and wants to complete his 85-mile-trip today. He will spend the next two nights back on Penny Island and explore the area for two days before attending the symposium on Friday. He will explore Port Dolomite either on his way to Prentiss Bay or on his way back to Penny Island today. 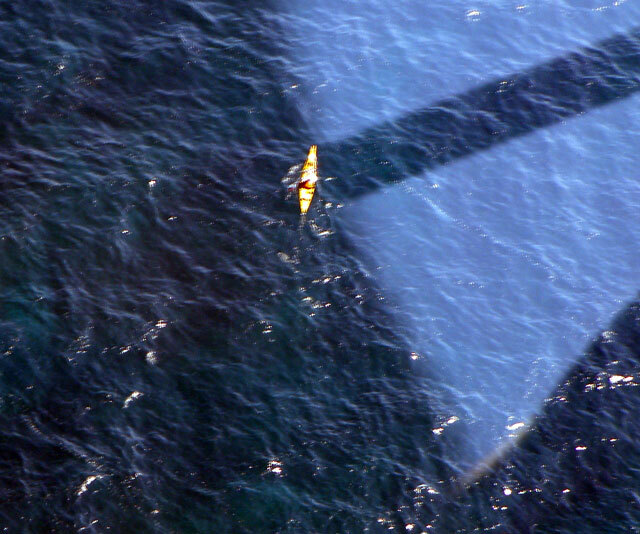 September 9, 2009: 4:05 p.m. Ken Bruland finished his Paddle for Food 85-mile distance by arriving via Penny Island and Port Dolomite to Prentiss Bay. He paddled back to Penny Island where he will spend a day or so to await his kayaking symposium.